Christina Brodie prepares for radiation treatment as part of her breast cancer treatment. Christina Brodie had come to Kansas to pursue a greater calling in life. After 35 years in advertising and becoming a vice president with a major global agency in New York City, she gave up most of her possessions to become an unpaid volunteer and start a new ministry helping impoverished families through the Sisters of St. Joseph in Concordia. Just months after settling at the Manna House of Prayer and launching her program, Hands Across Our Community, she felt a lump on her breast next to her chest wall. Within an hour of sending the request she received a return email from the patient navigator at the Cancer Center, Lynn Marshall, who helped her get an appointment for a mammogram at Salina Regional’s Outpatient Imaging and Breast Diagnostic Center. A mammogram, a sonogram and an eventual biopsy would confirm Brodie indeed had stage 3 breast cancer. She elected to have a double mastectomy performed by Salina Regional Surgical Associates surgeon Dwane Beckenhauer, MD. Throughout the diagnosis and initial treatment Marshall kept close tabs on Brodie and informed her that she might be a candidate for a clinical trial that was open to patients with her specific type of breast cancer. 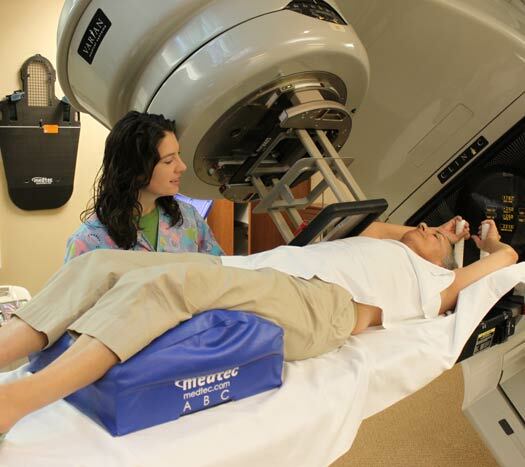 The Tammy Walker Cancer Center’s affiliation with the University of Kansas (KU) Cancer Center through the Midwest Cancer Alliance gives local patients access to many of the latest clinical trials available at KU. 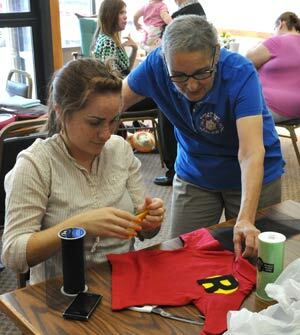 Brodie looks on as a young mother creates Halloween costumes for her children at Neighbor to Neighbor, a ministry of the Sisters of St. Joseph. Clinical trials are available to treat many forms of the disease, including lung, gastrointestinal, genitourinary, breast and other cancers. The trials use some of the newest drugs on the market to combat the disease and often use standard-of-care drugs in different combinations and doses than nontrial patients might receive. Trials are also available for screening and prevention of varying forms of cancer. Brodie’s trial used an experimental combination of drugs, one of which was known to cause potential side effects to the heart. Six months of chemo were followed by two months of radiation. Brodie experienced minimal side effects throughout treatment and was able to launch her pilot project helping at-risk families in Concordia. Hands Across Our Community provides families with life- and work-skill information and then pairs them with one-on-one coaches to teach them how to set and achieve goals and become financially self-sufficient. “I lost my hair and felt fatigued and nauseated, but my symptoms were very mild compared to what others experience,” Brodie says. “I was very fortunate. The support of the Sisters and the staff at Tammy Walker, and my work with families in our program allowed me to keep a positive attitude. To see the article as it appeared in the Winter 2014 issue of Health Beats, CLICK HERE. I would like to thank the Tammy Walker clinic for everything they did for Christina without her my girls would not be where they are today. She was and is one of the best things that ever happened for my family. I hope she continues to do all she does for all the families I Concordia. I just want to say thank you all from the bottom of my heart and my girls say thank you also. Weall love so much. You have given my girls so much hope!!!! !